Whale watching is a tourist attraction at Mirissa Beach of south Sri Lanka. As terrorism is wiped out successfully in Sri Lanka, tourism is picking up. is located in between the towns of Welligama and Matara. is about 35 km south of the port city of Galle. 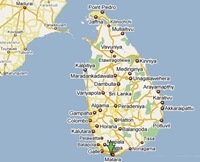 is about 150 km south-east of Colombo. is also closer to Hambantota, a port being developed with massive Chinese assistance. View whale watching photographs from China Gate. View an interesting short video clip: Blue whale in Mirissa Sri Lanka. For more details, log on to Mirissa Beach. Why Indo U.S Nuclear Deal, When Oceans can Give Clean Energy ?